*Tourists are advised against traveling to southern regions of Sudan and territory near the border with Libya due to terrorism and civil unrest. 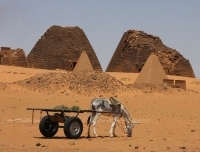 Sudan is not a country to visit for traditional sightseeing or a typical tourist experience, but rather a destination for those keen to get totally off the beaten track and meet people largely untouched by the preoccupations of the developed world. In the north, the Nubian Desert forms a large part of the country, where huge clay water pots can be seen under every tree or shady shelter to provide much-needed sustenance in the heat. In contrast, the narrow strip of land running the length of the Nile River is lush and green. Desert towns have wide, dusty roads, which seem eerily empty at midday due to the heat. In the evenings, however, the streets come alive with movement and colour, the women's vivid wrap-around clothing and hennaed fingers standing out from the crisp, white kaftans and turbans of the men. Beyond these barren desert reaches, the south is characterised by swamps and rainforest but is generally considered less safe for travellers. Torn into North and South Sudan by cultural and religious disputes, it is the north that occupies the largest area and includes most of the urban centres, including the capital, Khartoum. The largely Muslim, Arabic-speaking population of this area are proud of their country and will take great delight in showing it off. For those in search of what Sudan has to offer, the peaceful capital at the junction of the White and Blue Niles, and its sister city Omdurman, are good places to begin, with the National Museum, a large souq (covered market), camel market, and the Tomb of the Mahdi. To the north of Khartoum are the ruins of the Royal City of Meroe as well as the pyramids in which the kings are buried. Kassala to the east boasts a wonderful souq known for its local variety of fruit and silver jewellery, and a desert landscape dominated by jebels, or hills. The war-torn south is largely rural and lacking in infrastructure, and holds little of interest for tourists. Sudan has been afflicted by violent civil wars for nearly half a century, and more often than not makes headlines for the wrong reasons. However, outside of the main conflict areas the country is generally considered safe to travel in, and those who get there will be treated with extreme courtesy and friendliness. The Sudanese take Arabic hospitality very seriously and it is unlikely that a traveller will pass by without an invitation to share in a meal or to visit someone's home. Travellers are advised to avoid all travel to certain parts of Sudan - mostly the southern states and border areas - and are advised to do comprehensive research prior to travel, taking government travel alerts into account.